With lots of lemons and oranges in the house at the moment, I think a few lemon buns are on the agenda. And maybe some lemonade. Lemonade is so easy, and is a real wow at any time of the year. Not just with kids but with adults alike. Served with lots of ice, in a big jug it’s a winner. And undiluted in some sparkling wine it makes a really great cocktail. Of course baked lemon pudding, is the essence of home cooked pud. Note I said “pud”, not dessert. There’s no finesse involved, no faff, no fancy dishes or elaborate piping. Just warm citrus pillowy sponge with matching curd that finishes off any meal, be it only a boiled egg! Of course the trick is to get a picture before the savages attack. Not the easiest. Then of course you can make fairy cakes/ buns/ queen cakes *insert other sponge type treat*. I’ve two favourites. 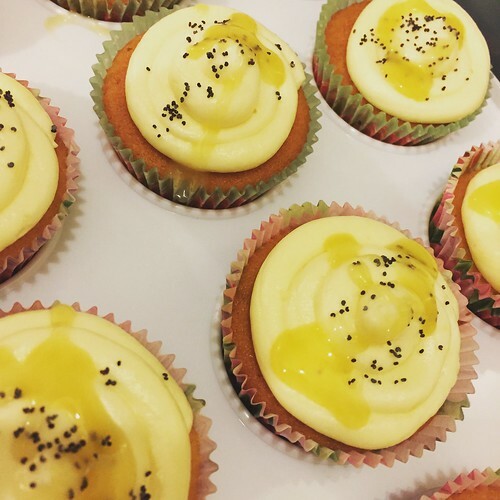 One just has zest with a lemon cheesecake topping…. It is without a shadow of a doubt, the lightest cupcake you will ever try. I must, at some stage try to make it as a whole cake. But then I might just eat the whole cake, as opposed to just eating the one cupcake… The other is a lemon sponge cupcake with chocolate added. I always feel adding chocolate to something causes it to exceed the sum of the two parts. 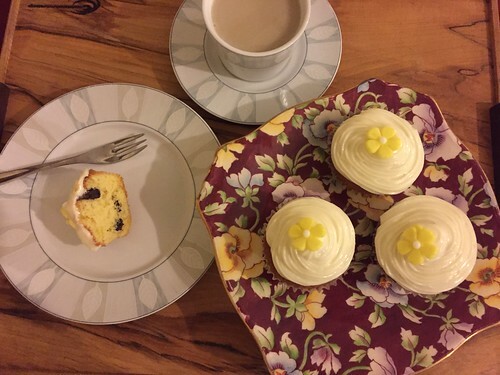 Simple, but elegant lemon and chocolate cupcakes. I think savoury lemon dishes deserve a blog post all themselves. But already my head is off on tangents involving tagines, or maybe lemon roasted chicken. Mmmmm. Nigel got lots of lemons recently, and I decided to make a few different recipes. The first was fluffy lemon pudding, which is a real family favourite. Very simple to make, once in the oven it transfers into layers. The top layer being a sponge, then a sauce, then a lemon curd at the bottom. The picture was hard to get as I was fighting off the family at the time. Next was homemade lemonade. 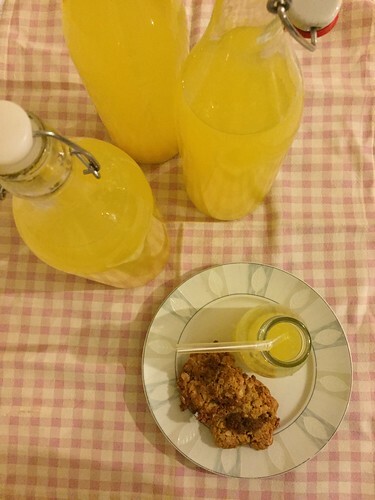 Everyday on the Ballymaloe 12 Week Certificate Course, someone has the task of lemonade duty. Its fun, easy, and everyone loved having lemonade at lunchtime. We had lots of lemons, which involved lots of squeezing. Luckily I have willing helpers! Next was the sugar syrup prep, which only takes 10 minutes, and not too much washing up. Voila! Ready for diluting and serving with lots of ice in sunny weather. The side effect of lots of lemonade is lots of halves of skin. So candied peel is the best way to use up these left over lemons. Darina’s recipe is easy, and in a number of stages, which makes it easy to fit in to the kitchen schedule. And you’ll never eat the bought plasticy gel peel again. Promise. The lemons are soaked overnight, then simmered until soft, a little like making marmalade. The pith, and membranes are then removed, and the shells then simmered in a sugar syrup until the syrup is at the thread stage. I should have removed the peel earlier and simmered the syrup further, to give a lighter colour to the peel, but it still tastes delicious, and is now jarred for use. And finally lemon meringue pie. The Sunday treat. And one of my favourite desserts, that I never normally order when out as so many factors can be disappointing, either the pastry, the curd, or the meringue. The pastry and lemon curd is made in advance, and although the time is required to get the pastry shell perfect, it’s time well spent. And the finished article. It was barely out of the oven before the family dived on it, it could have done with a couple of minutes resting.